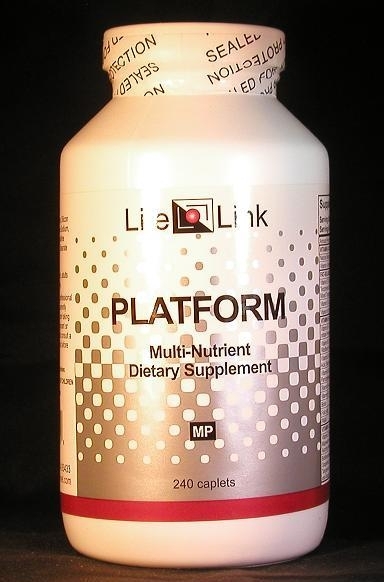 Platform is a multi-vitamin, multi-mineral, multi-antioxidant formula that was engineered to be the most potent and balanced multi-nutrient formulation available anywhere. Six Platform tablets a day deliver all the vitamins, minerals, antioxidants, and trace elements your body needs to remain healthy, and it gives you compounds widely accepted to be crucial for optimum health and cognition. Multivitamins are typically built from whatever raw materials are cheapest and densest — to maximize the manufactuer’s profits and minimize the tablet’s physical size — instead of from what your body can actually assimilate and use. This allows a single tablet to claim to supply a reasonable fraction of the FDA’s recommended daily allowance (RDA), low as it is, and still be swallowable. Reducing the physical size of vitamins like B and C is impossible, since the chemical structure is fixed, so manufacturers just reduce the amount present. Minerals, however, are a very different story: the simpler the mineral complex, the less space it takes up physically, but the more difficult it is for your body to absorb. Beyond absorption issues, many multivitamins contain harmful components like iron, which promotes cancer and heart disease, and accelerates aging. All of this is why LifeLink’s Platform™ is totally different from ordinary — and largely useless — multivitamins. That’s no accident! We engineered Platform from the ground up to be the most potent and balanced multi-nutrient formulation available anywhere. Period. We started with a solid blend of quality vitamins (B-1, B-2, B-3, B-5, B-6, B-12, A, D, K, biotin, folic acid, PABA). Then we added in a superior mix of potent antioxidants (C, E, natural alpha- and beta-carotene, bioflavonoids, lipoic acid, catalase, limonene, carnosol, anthacyanidins, dithiothiones, nordihydroguairetic acid). Next, we selected an optimum blend of electrolyte, macro, and trace minerals (calcium, magnesium, copper, zinc, chromium, selenium, potassium, manganese, sulfur, boron, silicon, iodine, molybdenum, vanadium, cobalt) complexed (aspartate, citrate, ascorbate, amino acids) for maximum absorption and bio-availability. Then we included essential sulfhydryl amino acids (L-cysteine, L-glutathione, L-methionine) and compounds widely accepted as brain-boosters (choline, DMAE, myo-inositol). We finished off with a variety of detoxifiers and cancer fighters, including chlorophyll (A, B, C, D), xanthophyll, barley grass and cruciferous vegetable extracts (algae spirulina, fucus, dunaliela, laminaria, chondrus crispus, macrocytis). Without a doubt, we packed a lot more into Platform than does any other supplement in its class. The result is impressive: a mere six Platform tablets a day deliver all the vitamins, minerals, antioxidants, and trace elements your body needs to remain healthy, and it give you compounds widely accepted to be crucial for optimum health and cognition. You can even, if desired, take Platform throughout the day for time-delayed absorption. It’s time you stopped wasting money on multivitamins doing little for you, and time to start taking Platform: the multivitamin designed to keep your body healthy. This is by far the best multivitamin I've ever used. I can tell the difference in my level of energy throughout the day. At first I i baulked at the thought of taking a supplement 3 times a day but I now understand how important it is.